Let us take time to remember two significant A Course In Miracles people who are no longer with us, the two people who are responsible for ACIM: Helen Schucman and William Thetford. These were the two people who were involved with the channeling, transcription, and first editing of the spiritual document we study. 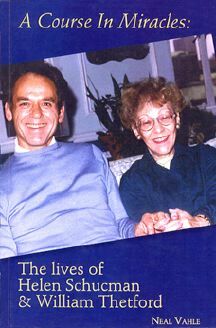 There is a new book titled, The Lives Of Helen Schucman & William Thetford. I met the author, Neal Vahle, at the conference we organized in February. He is a local San Francisco person. He has also visited our local center. I have talked to him about his book and how it came to be written. That was an interesting story. It is significant that I have actually read this book because I very rarely read books in their entirety. I seem to have so little time to do discretional reading. Something must be shifting. A miracle has happened, because in the past six weeks I have read two books. It was fun. I think I will read some more. For years, when people asked me to read their books, I would reply, “I don’t read.” However, I can not say that anymore. I do read. I found this to be a very interesting book. There have been biographies before of Bill and Helen and the story of the channeling process. Those books contain the unusual story of how A Course In Miracles came to be published. We have had Journey Without Distance written by Robert Skutch and published by the Foundation For Inner Peace (FIP). FIP was the first publisher of A Course In Miracles. That book has been around for many years. Many of us have probably read it. Ken Wapnick wrote his version of their biographies and story of the channeling titled Absence From Felicity. I remember reading that many years ago when it first came out. We also have the movie that FIP produced many years ago named The Story Of A Course In Miracles. William Thetford was still aalive at the time the movie was made so he actually appears in that documentary. All of those sources, over the past thirteen years, have come under suspicion by many students because during the copyright court case and the subsequent trial (1996 to 2003), we all learned that some of the things that we had been told through these sources, didn’t happen the way we were told. This manifested an odd energy. Discerning A Course In Miracles students no longer knew what to believe and what not to believe anymore. Since that time I tended to distance myself from A Course In Miracles’ early history because I needed ACIM to be significant for me just for what it was in my life, regardless of what its history was. We couldn’t truly know what the history was anymore, so many of the things that we thought about it were actually misrepresentations. I thought it was better to give myself some distance. However, with this new book, I thought I’d try out the historical waters again to see if they were safe for me. To give you a little background the channeling of A Course In Miracles started in October of 1965, and it was completed in 1972, a seven year time period. I was 13 years old when the Course began to be channeled and 20 when it was completed. Helen Schucman was 56 years old when she started the channeling process. Synchronistically, I am currently 56 years old. Helen lived to be 71, being born in 1909 and passing in 1981. William Thetford only lived to be 65 years of age. He was born in 1923 and passed away in 1988. Neither of these ages is considered very old by today’s standards. From these two early examples we could say that involvement with A Course In Miracles doesn’t guarantee longevity. Bill Thetford was 14 years younger that Helen and he was only 42 years old when the channeling started. There were some interesting facts I learned about Bill Thetford from this book. Some of these things I had heard before but they are gone into in more depth. He was born into a Christian Science family. Christian Science shares a lot in common with A Course In Miracles. I found that to be an interesting sidelight. His family turned away from Christian Science when he was a boy because of the death of a sibling of his. That experience soured them of the Christian Science religion. They became more agnostic. Another interesting fact about Bill Thetford is that when he was in college he worked as an administrative assistant on the Manhattan Project. If you don’t remember, that was the project that created the atom bomb. He had some kind of secretarial position there. I found that a little odd. However, it got even odder for me because in 1951 to 1954 he worked for the CIA in something called Project Bluebird which was about mind control. This project later turned into what was called MKUltra which became a big scandal when it was exposed a number of years ago. Perhaps you remember. This was the program that gave people mind altering drugs, including LSD, without the people being aware of it and then the CIA observed their behaviors. Some of these drugs were administered to prison inmates. The CIA was trying to figure out if you could control the minds of people. Could the CIA get people to be more truthful when interrogated? Could the CIA get people to do things against their will or personality? Could the CIA develop true “sleeper” agents who might be unknowing assassins as was depicted in the famous film The Manchurian Candidate. None of these projects seem very nice and they remind us of the current torture scandals going on in our country. Apparently Bill wasn’t involved in any of these mind control activities directly. He was involved in creating something called the Personality Assessment Program. Bill Thetford worked for the CIA for three years. He finally did leave the CIA and went to work for Cornell University, synchronistically, my alma mater. Oddly enough, the department he went to work for was funded by the CIA. In this respect, he hadn’t truly left the CIA. I find this CIA involvement strangely distressing, especially since he worked in their mind control programs. A lot of people call A Course In Miracles a type of mind control. So it goes. Helen was born into a wealthy Jewish family. They were non-worshipping Jews, more social Jews. They were quite well off and lived in New York City. She did get exposed to various Christian teachings and churches when she was a young girl through her involvement with two housekeepers or nannies. One thing I didn’t know was that during Helen’s adult life, and especially in the later part of her adult life, she practiced many Catholic rituals. She was very fond of saying the rosary. She wore Catholic medals and she frequently went into churches to pray. She tried to take Bill Thetford to Catholic churches. She wasn’t to successful in that. However, she was successful in taking Ken Wapnick to Catholic churches to pray and say rosaries. I find the image of Helen Schucman and Ken Wapnick saying rosaries together in Catholic churches amusing. She did pray a lot in her later years. If you know anything about Bill Thetford and Helen Schucman you probably know that their relationship was problematic. They had what we call a love/hate relationship. They were still able to give us the A Course In Miracles while working through all that. They managed to continue to work together and that is remarkable. This proves that one can ignore the ego even when the ego is still very strong. You can still do the work that God wants you to even if your ego is raging. It is generally thought that Bill and Helen never did truly heal their relationship. This book strongly reinforced that idea. During the last few years of Helen’s life their relationship even appeared to degenerate. Bill Thetford left Colombia University, where they were employed, in 1976 which was the year A Course In Miracles was published. First he was on sabbatical and then he was on leave, but he never did return to Colombia. He was only 53 years old when he took his sabbatical and when the Course was published. Bill moved to California in 1978 and spent the last ten years of his life living in California. Eight of those years were in Tiburon, a short distance north of San Francisco, and the last two years of his life he was down in La Jolla in the San Diego area. If you have heard accounts of Bill Thetford’s life during those ten years they are always very glowing. Everybody has wonderful things to say about Bill Thetford during that period. They speak of what a calm energy he had, and what a symbol of peace he was. They also speak of what a powerful presence he was. It’s always mentioned how he never emerged as a teacher or guru of the Course even though he was present in many A Course In Miracles groups and circles. People always speak of the peace that emanated from him at meetings. People were quite impressed with him. They got high off of his energy. Bill Thetford was a gay man and he had lived with a few men during his life in New York City. He continued to have relationships with men after moving to California, but he was fairly closeted. He didn’t think that it would be good for his professional career to come out as gay. Later he didn’t think that it would be good for A Course In Miracles if people knew that one of the main people who was responsible for it was gay. Later in his life, especially when he lived in San Diego, the people that he lived with took him to gay A Course In Miracles meetings, or meetings that had mostly gay attendees. Apparently he really loved those meetings, and it is said that he came out a little bit more during that time. Even though Bill was a gay man, he did live with a woman for a short time when he was in Tiburon, and he had a very close and affectionate relationship with this woman. They were seen to hold hands and even embrace. However, the woman has stated that there never was anything sexual between them. It was only an affectionate, living together relationship. After that relationship ended, he was frequently seen with another woman whom he dated for awhile. This book tells us that he was very romantic with her. She is still alive and was interviewed for this book. She said that she always took his romance as sort of an experiment on his part. She never took it very seriously. She thought he wanted the experience in life of being romantically involved with a woman, so he played that role with her. She also said that they were never sexual. I don’t know how much of this is true but I found the most interesting part to be that he thought his being gay would be a detriment to A Course In Miracles and that he made attempts to live the appearance of a heterosexual life. The author of this book, Neal Vahle, is not actually an A Course In Miracles student. He is a student of new thought religions, and he is familiar with the Course, but he doesn’t describe himself as an ACIM student. He does go to church. He told me he always goes to a evangelistic, United Methodist church in San Francisco named Glide. In fact, he told me he was “addicted” to Glide especially because of their terrific music, choir, and enthusiastic fellowship. He was asked to write this book by the Foundation For Inner Peace. They gave him access to all the unpublished materials they were holding in their archives. They had Helen Schucman’s unpublished autobiography in their archives. They have many interviews that Bill Thetford did for a variety of people. They gave Neal Vahle access to private letters, and much more, that they were holding. I’m still not clear why this has come about. It would be interesting to find out. My guess is that since the FIP and Ken Wapnick have some negative press going on about them, especially around the early history of A Course In Miracles, perhaps FIP wanted an impartial third person to write an impartial biography. FIP would give this impartial author access to all the materials so that the story could be written without any self serving suspicion. If that were their motive for asking Neal Vahle to write this, then they are to be congratulated..
Neal Vahle has experience writing biographies about religious figures. He wrote a biography of Ernest Holmes who is the founder of Religious Science. He wrote several books focussing on the biographies of Charles and Myrtle Fillmore who were the founders of the Unity School of Christianity. The Foundation For Inner Peace sought out an experienced writer in the spiritual field, and they wanted him to do this. I was told by Neal Vahle that there was no financial arrangement between them, and the book is not published by the FIP. As I said earlier, there were misrepresentations in the story of how A Course In Miracles was born that surfaced during the copyright controversy. As a result of those, revisiting the story of Bill Thetford and Helen Schucman was not a natural thing for me. The controversies had left a bitter taste in my mouth. Two main things that proved controversial, and untrue, were significant for me. The first was the story that they had changed almost nothing from the original channeling to the publishing of the Foundation For Inner Peace ACIM book in 1976. However, with the publishing of the Original Edition and, recently, the publishing of the Urtext (both available through the CMC bookstore) we learned that massive amounts of material had been changed. I remember watching the video The Story Of A Course In Miracles and listening to people say not one word was changed. However, everyone close to the material must have known how much of it was changed. Why were we told this untruth? Perhaps saying it was virtually unchanged did make a much better story. The second disturbing thing was that Judy Skutch, the person who eventually got A Course In Miracles published, had repeatedly told the story of how she kept copying and copying ACIM manuscripts to give to people who were interested. When this became significant during the copyright trials, since this distribution could nullify the copyright, she then said that her frequently repeated story wasn’t true. She said on the witness stand that she had been exaggerating all those years, and that the often repeated story was mere hyperbole, which means extravagant exaggeration. If she were extravagantly exaggerating her story of copying and copying, and that wasn’t true, how could we truly believe her other stories? These things were difficult for me to deal with. The stories of how A Course In Miracles came to be channeled, and then published, were like ocean waters that were infested with sharks. I didn’t want to swim around in those waters. However, I think with this book by Neal Vahle, it is safe to go back into the historical waters. It is once again safe to go back into history because he does an excellent job of presenting all the information in a very realistic way so we get to judge it for ourselves. He also personally interviewed many people for the book. A lot of the book is simply quotations from these interviews and from the source material he was given access to. The reader then gets to make his or her own judgments about what seems true and how the events actually did unfold. Bill Thetford and Helen Schucman emerge as very complex people, which of course they would be. They were full of all kinds of foibles, problems, and difficulties. They were people, like everybody else. Helen Schucman emerges as a very fearful woman. She had many fears and paranoias, and she was very controlling. The book tells how controlling she was with Bill, frequently trying to get him to do the things she wanted him to do. She did, later, get Ken Wapnick to do much of what she wanted him to do. She also got her husband, Louis, to do much of what she wanted him to do. Everybody seems to be in agreement about this characteristic. There was some new information about how problematic the relationship was between Ken Wapnick and Bill Thetford. Apparently, when Ken Wapnick came on the scene, it created a lot of problems for Bill. Here is a statement from this book from Judy Skutch, “Bill told me that he had been the subject of her [Helen’s] love/hate relationship. After the arrival of Ken, Helen split them in two and Ken became the object of her love, leaving Bill the object of her hate. Suffering two and a half years of that triangle, Bill was totally miserable when I joined them in May, 1975.” (Lives, pg. 98) Bill moved away from New York City and largely extracted himself from the relationship with Helen partly because this relationship was so problematic. We get to see that all was not great between the people who were the first teachers of A Course In Miracles, but I’m not disillusioned by that, and I actually like knowing all these things. Much of the earlier biographical material presented them as one big happy family all of the time, and it didn’t seem real. This account is much more real to me. These were real people who had relationship problems just like mine. I have relationship problems. Everybody has relationship problems. Bill was very active after A Course In Miracles was published. He went to many Course meetings in the San Francisco area and in La Jolla. He planted the seeds of a tremendous amount of Course proliferation through ACIM study groups. We keep a study group directory here at the Community Miracles Center. It’s on our Web Site. There are many times more study groups in California than there are in most states. California is the hotbed for A Course In Miracles. There are study groups all over, but no where are there more than in California, not even close. I believe some of this has to do with how active Bill was in attending these early study groups which then seeded other ones. Bill was a prominent presence in many early groups. Bill also took part in a lot of workshops that Judy Skutch organized. Judy would introduce A Course In Miracles and then Bill would say a few things. These introductory workshops were very important in the early spread of the Course. I found out through this book that he was very nervous about speaking in public and he would have anxiety attacks about these speaking engagements. He even took medication to calm his anxiety down so that he could stand up in public. That was an interesting bit of information. I wonder how he’d feel about this personal information being out in the public. He wanted to be a private man. Bill was interviewed by Jim Bolen who was the editor of New Realities magazine at the time. Jim Bolen asked Bill Thetford what were the key tenets of A Course In Miracles. Bill thought about it and he identified twelve. I thought it would be useful to go over these twelve main tenets that Bill Thetford, one of our first teachers of the Course, identified. This definitely seems true for me. All the various practices of A Course In Miracles are to make us more loving – how to get us to manifest more love in our relationships and in all of our interactions. We need to especially let go of the fearful way we look at people. We have to let go of the idea that anybody could actually hurt us. We need to let go of the idea that, in some way, we could be the victim of an evil intent, or even a simple uncaring intent. Bill said that this was the foundation of A Course In Miracles. The Course was all about forgiveness. I definitely believe this to be true. A key teaching of ACIM is that it is showing us how to be truly forgiving of ourselves and of others. I feel that I have made great progress on that one. I don’t find this hard to do anymore. When somebody upsets me it is very soon that I am able to turn that around and be forgiving. We need to train our minds to remember who and what we are. I had to smile about this one because I thought about all of Bill’s early work with the CIA which was about mind control and mind training. This seemed to be an interesting synchronicity. We need to shift our perception from fear to love, from guilt to acceptance. These shifts were the key to a miracle. I agree with this as well. I believe these shifts are the miracle itself. In the world when we say there is a sin, we somehow think this justifies our wrath, our negative judgment, or some kind of punishment. However, mistakes simply call for correction. That shift in A Course In Miracles is fundamental. We need to shift off this idea that when sins happen they call for some kind of retribution and shift it to the idea that mistakes are something that just call for correction. I think that this tenet is a very important one, and I think that it is missed by many ACIM students who think that by saying there is no sin it makes everything that happens in the world fine. It isn’t that everything is fine. There are still lots of mistakes out there that need to be corrected. We have to get rid of the guilt and punishment part of this idea and truly see it as something that needs to be corrected. Everything I do and think is not fine. A lot if it is a mistake. I need to see that. I can’t gloss over that by saying everything is perfect. Everything isn’t perfect the way it appears to me. Everything is perfect in Reality but I have to see that I make mistakes or I won’t act to correct them. I believe that this is one of the most fundamental tenets of all. It’s right up there with forgiveness. We have to learn how to rely on the Holy Spirit to help us with all the decisions and all the perceptions that we have. In A Course In Miracles we learn to think of Jesus as a wise older brother, someone who helps us to access our inner wisdom, or helps us access the Holy Spirit. This is a wonderful idea. I certainly like this. Sometimes I am better at this than other times. Sometimes Jesus does feel real to me and sometimes I don’t know who Jesus truly is. I am being honest with you all here. I do believe that A Course In Miracles spends a lot of time trying to correct some of the problems that have become part of traditional Christianity. I would want to clarify this because there are other New Age Christianities that are much more aligned with the Course’s viewpoints. Certainly traditional Christianity’s belief in sin needs to be corrected. The teaching that God the Father sent his only son down to earth to be crucified needs to be corrected. Traditional Christianity teaches that Jesus’ suffering somehow does away with our need to suffer. ACIM spends a lot of time trying to correct that. Suffering does not atone for anything. A Course In Miracles teaches that the body lives and dies but our Spirit is eternal. I firmly believe this. This is a very important thing. I usually include an element of this into any guided imagery prayer that I lead. I always have us let go of the surface appearance and go into the eternal Reality underneath it. I am constantly working on remembering this for myself. Bill talked about our need to unlearn the harmful things that we think we have done so that we can experience more joy and happiness in our lives. I think this is fundamental, and I admit that I have my own difficulties with this. Sometimes I do not feel joyful; sometimes I don’t feel happy. However, I know that I could be if I could get my mind straight and unlearn these harmful thoughts. That’s my task, and that’s my vocation. That is what we are here to learn. I thought it was interesting that none of Bill Thetford twelve tenets had anything directly to do with God. His twelve tenets definitely show a more agnostic approach to the A Course In Miracles philosophy. One of the things I saw by reading The Lives Of Helen Schucman & William Thetford was that A Course In Miracles, in its early history, was truly embraced and practiced by a lot of high level, highly professional people. These professionals were, Ph.D. professors, psychiatrists like Gerry Jampolsky, professors of psychology and professional psychologists, people like Frances Vaughan and Roger Walsh. All of these are very high level, in worldly achievement, people. I find that interesting. A lot of spiritual and religious movements have been started by more common people, more every day people. Certainly, early Christianity started with common people, actually the poor people. It started with those people and rose up. ACIM has been a spiritual movement, or practice, that started with the intelligentsia and filtered its way down. I’m not sure what the significance of that is but it is interesting to think about. As I said, with this book it is safe to get back into the historical waters. The reader does get to see the very real and human people who were instrumental in the early history of the Course. I feel that this is very consistent with what A Course In Miracles tells us. Relate this next quotation from the Course to Helen Schucman, Bill Thetford and all the many people who were involved with the early history of the Course. We don’t have to think of Bill and Helen as perfect people or even as highly spiritually evolved people. They were teaching perfection. They got as far as they got. They produced a great work with the spiritual development that they had. They started a whole spiritual movement. We owe them a real debt of gratitude, but we don’t need to worship them or put them up on any kind of pedestal. I have always loved that idea from the Course. This quotation tells us that we are teachers the first time we see that our interests and someone else’s interests are actually the same and that we are joined with them. We see that their good is our good and we have become a teacher of God. Being a teacher of God has nothing to do with anything religious. It has nothing to do with even believing in God. One could be agnostic or even a nonbeliever. All you have to do is believe in the common humanity of people, that we are all joined and that we all share the same goals. If you do that simple thing you could be a teacher of God. I am certain that this is true for most of us. We are all teachers of God equal to our first A Course In Miracles teachers Helen and Bill. We can respect them without holding them up on a pedestal. This article appeared in the February 2009 (Vol. 23 No. 3) issue of Miracles Monthly. Miracles Monthly is published by Community Miracles Center in San Francisco, CA. CMC is supported solely by people just like you who: become CMC Supporting Members, Give Donations and Purchase Books and Products through us.